I’ll admit to having no idea what a Dengeki Bunko was before booting up this game, but I’m always up for a sleek-looking 2D fighter (especially on the original Vita’s OLED screen). Turns out the Dengeki Bunko publishing imprint has released more than 2,000 light novels in its 20+ year history (I’m a little behind), and its universe encompasses a host of titles that have been adapted into anime and video games. 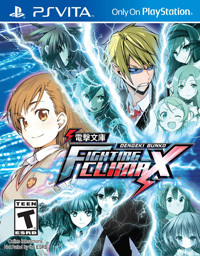 Dengeki Bunko: Fighting Climax pulls a bunch of fighters from this rich history and pits them against each other in a star-studded battle along the lines of Super Smash Bros. or Marvel vs. Capcom. As a fighting game, it plays great: characters are responsive, fast and mobile, so dashing and jumping around the screen to put pressure on your opponent is easy and satisfying. The four-button controls and command lists also exhibit just the right amount of depth for a fighting game on the Vita — not too much to learn or feel overwhelmed by, but enough variety so matches don’t get boring. Solid mechanics isn’t the only thing a fighting game needs to stand out nowadays, though — it needs personality, and Fighting Climax nails that part. The character designs are great, from the SNK-vibe of Black Bullet‘s sleek Rentaro Satomi to Strike The Blood‘s Yukina Himeragi, who wields a giant sword in a schoolgirl outfit. The colors are bright, the animation is smooth and the Sega references (Shinobi, Virtual On and is that a Dreamcast controller on someone’s head?!) offer great nostalgia. The backgrounds could use a little more inspiration and detail (BlazBlue has us all spoiled), but overall Fighting Climax is a solid, energetic fighting game on the Vita that offers a fascinating glimpse (for the uninitiated) into the wide world of Dengeki Bunko.